The Grand Strand is home to many Myrtle Beach championship golf courses and Pawleys Plantation is one of the finest. This is a Jack Nicklaus Signature course in which he designed “to capture the natural terrain and complement and enhance the beauty of the saltmarsh and Lowcountry. This award winning par-72 layout has all of the features one would expect of a Lowcountry golf course. 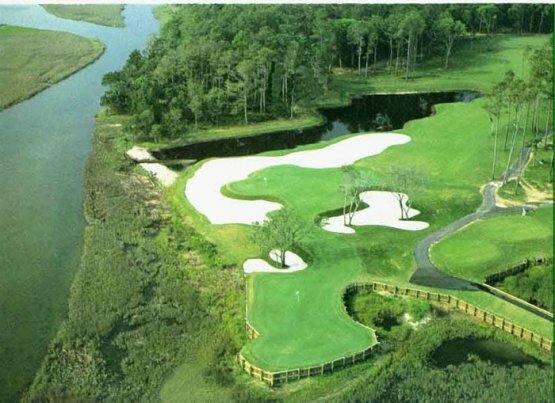 The course winds its way through beautiful hardwoods and towering pines while it borders the marshlands that separate Pawleys Island from the mainland. Nicklaus used his unsurpassed knowledge of golf to design a course that incorporates strategy and positioning off of the tee as well as power. As you navigate your way through this gorgeous course, the sheer beauty will capture you and offer many Myrtle Beach golf photo opportunities. The undulating greens are TifEagle Bermuda grass and they provide a true roll. This Myrtle Beach golf course can be very challenging, but five sets of tees ensure that golfers of all levels can enjoy this gem. While visiting Myrtle Beach be sure to enjoy all that the Grand Strand has to offer. Myrtle Beach State Park, Huntington Beach State Park and Brookgreen Gardens all are outstanding opportunities to enjoy the great outdoors and the beautiful Myrtle Beach weather. The Hammock Shops in Pawleys Island offer a unique Myrtle Beach shopping experience. Book your Myrtle Beach golf package now!